The third scene of Amelia takes place in Vietnam. Whereas many of the other locations in the opera are places where we Americans in the audience might feel at ease--a suburban home, an urban apartment, an office--the Vietnam scene is not supposed to feel cozy and familiar. I expect Daron Hagen’s music for this scene will once again prove the old axiom: music always trumps picture. Set Designer Thomas Lynch and the Seattle Opera Scenic Studios have created a truly awe-inspiring set for this scene, with a dazzling backdrop where sunbeams break through the clouds onto verdant mountains and a river meanders away into the distance. But Amelia and her mother Amanda have come to this village to confront their worst fears, to try to find out what happened to Dodge; so the music destabilizes the beautiful location, helps us to feel their anxiety, their isolation, their reaction to the upsetting memory of extreme violence and terrible tragedy relayed to them by Huy and Trang. …not to characterize Vietnam, or the Vietnamese, but to show us how out of place two affluent 1985 American ladies are in this North Vietnamese village. Once upon a time, Western opera composers loved throwing together musical clichés about Asian countries for operas with ‘exotic’ locales. Much has changed since then, and nowadays an American composer like Daron Hagen wouldn’t presume to write music about the Vietnamese experience, although he does use a melody (for Trang’s startling final statement) from a well-known Vietnamese folk song. 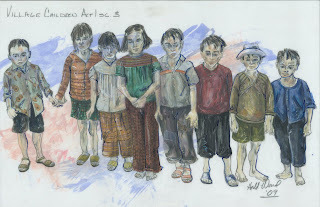 It was important to Hagen that his Vietnamese characters, Huy and Trang, be presented sympathetically in the opera; the audience must believe in them and like them. So he wanted to get their musical utterances exactly right. A challenging task, when you don’t speak Vietnamese! Vietnamese is a tonal language, so the intonation of every statement is part of the statement’s meaning. The word “con gái,” for example, means “daughter”--if the speaker bends the pitch upwards on the second syllable. (If you don't pronounce the pitch bend properly, you could very easily end up saying “chicken” instead.) When Hagen wrote the music for the scene, he worked closely with several Vietnamese language advisors who helped him craft each musical utterance of the Vietnamese characters; they sometimes spent up to an hour on a single sentence, getting the ups and downs exactly right. The Vietnam scene, with its flashback to a memory of horrific wartime violence, is probably the most gripping and dramatic scene in the opera from the point of view of plot. Musically, it never expands into lyrical beauty and release, because comforting music wouldn’t tell that story. Amelia was crafted, by McFall and Hagen and Wadsworth, as gesamtkunstwerk. That is, they chose to include in their opera only scenes which would have an emotional impact even in pantomime: losing a loved one, crashing a plane, escaping from prison, a nervous breakdown, resuscitation, death, birth, and this terrifying scene in Vietnam. The idea is, the story itself carries power: what you see onstage, the music you hear, and the words you understand are all ways of approaching that story, doors that can open to you its emotions. This scene, with its morally impossible situation and agonizing dilemma of good and evil, may be the closest Amelia gets to the drama of Benjamin Britten. Hagen references Britten, as a matter of fact, twice in this scene. With his eclectic and allusive brain, he’s more than happy to quote or allude to other composers (indeed, he loves the operas of Richard Strauss because of this very feature), and here he acknowledges using a chord from Britten’s Billy Budd and a line from Peter Grimes. 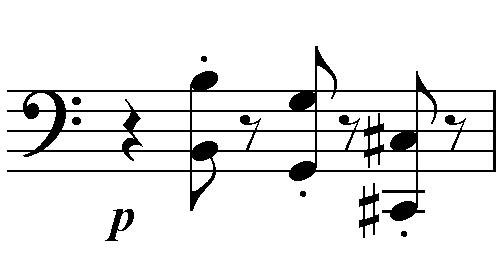 The ‘diad,’ a polytonal cluster juxtaposing Bb major with B natural minor, represents the struggle between good and evil, heaven and earth; in the soul of Billy Budd’s Captain Vere, the struggle between Billy and Claggart; in Amelia it indicates Dodge’s indeterminate status--alive or dead? Tragic figure, but because of fate or of human volition? Dodge’s solo line in the Vietnam scene, “I have faith in God, I have faith in my country, I will do my duty,” sung on a quiet monotone and marked by Hagen “Otherworldly,” similarly mimics Peter Grimes’s first line, “I swear by Almighty God,” referencing that character’s way of being beyond the reach of human events. In English and American opera, the most powerful, emotionally expressive moments can in fact come through restraint--when a character restricts himself to singing all his text on a single pitch. i do it, i think good. Thank for share. can i share info to my facebook?